Carnivorous plant, rhizomatous perennial with leaves modified to form trumpet-shaped tubes that trap insects. 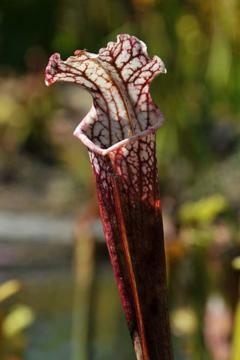 The narrow erect 'pitchers' are green or yellowish at the base, strongly shaded and veined dark red towards the tops, often with white blotches. Red flowers in spring. Needs consistently wet or boggy, lime-free soil, which is low in nutriants. Full sun in a sheltered position. Prefers warm conditions but may survive short periods just below freezing in winter.